The Niagara Handheld Earth Massage showerhead provides satisfactory water pressure while limiting water flow to 1.5 gallons of water per minute. It achieves this using a non-removable flow compensator. 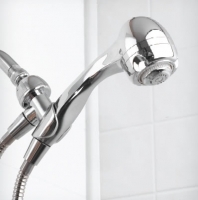 This low flow showerhead is non-aerated, meaning less warm water is lost between the showerhead and you. It is adjustable, and has 9 jet turbo massage settings: from a forceful jet spray to a gentle needle massage option. The water flow is consistent, regardless of the settings chosen. The hose measures 72 inches in length and has an ABS thermoplastic body. It is water sense labeled. Saves water and money while delivering satisfactory performance, pressure, luxury, and appearance! 1.5 GPM flow rate remains consistent regardless of pressure.